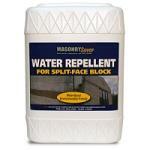 Split Face Block Water Repellent protects from Acid Rain/ De-icing Chemicals.Mildew /fungus resistant. DEFY Split Face Block Water Repellent is a waterborne block sealer that causes water to shed, and significantly reduces water penetration into a wall system. It is specifically designed for lightweight, split face and fluted block. This product is a silane/siloxane blend with acrylic elastomers that penetrate small pores and reduces the size of larger ones. This combination gives DEFY Split Face Block Water Repellent the advantages of both a film forming coating and a hydrophobic silane/siloxane water repellent. This UV stable product allows for penetration of up to 3/4 of an inch or more depending on porosity of the concrete masonry unit. This creates a deep, long-lasting waterproof zone within the surface while producing only a minimal glossy look. This product is recommended for use on all porous, vertical, above grade concrete masonry units including smooth, split-faced, burnished fluted or ribbed, and concrete brick. Natural substrate color and surface textures are only minimally affected, adding only a slight sheen and darkening. It can be used on denser clay brick where some gloss and sheen are desirable. DEFY Split Face Block Water Repellent can be painted over with most quality oil base paints that are recommended for exterior masonry surfaces. Coverage rates will range from 40-125 square feet per gallon depending on surface porosity. Product dries to the touch in 30 minutes to 2 hours depending on temperature and humidity. Testing is recommended before treating any surface to ensure desired results. From J Lavrich of Pittsburgh, Pennsylvania on 9/30/2014 .